Year after year, in every facet of production, "When followed only one standard called precision, Success has followed us naturally." This approach has laid us to different milestones. A-Class Marble possesses the largest warehouse in Delhi spread over sprawling 2 lac sq. ft. along with 5 lac sq. ft state-of-the-art production unit in Kishangarh. The facility is equipped with ultra-modern Italian machineries, under the strong supervision of highly trained engineers, managers and technicians. The marble, which successfully passes through the stages of stringent checks, reaches our world-class facility at Kishangarh. 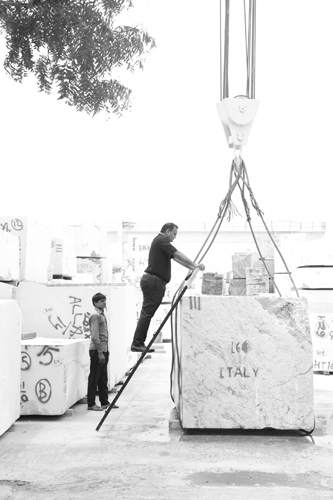 Through ultra-modern techniques and cutting-edge machineries, these raw blocks undergo a long and patient process that unearths the real essence of marble and transforms it into pieces of art. Offloading raw marble blocks in the gantry yard with help of advanced gantry cranes. 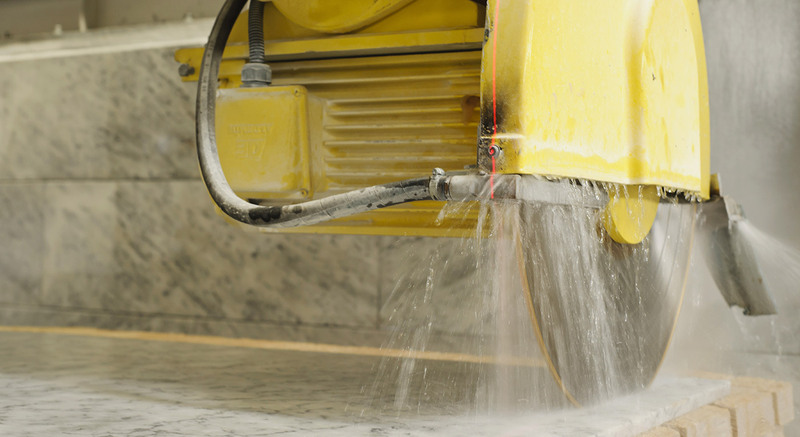 First step is cleaning the marble blocks through highly pressured water to erase the outer dust particles. The dressing machine team dresses the marble blocks from all the sides to make its surface plane and erase natural defects. Blocks are reinforced with fiberglass net with a semi-solid reinforcement formula from Tenax S.p.A. of Verona, Italy. After applying it on all the four sides, the blocks are cured to make it withstand breakage for sawing through the Gangsaw machinery. 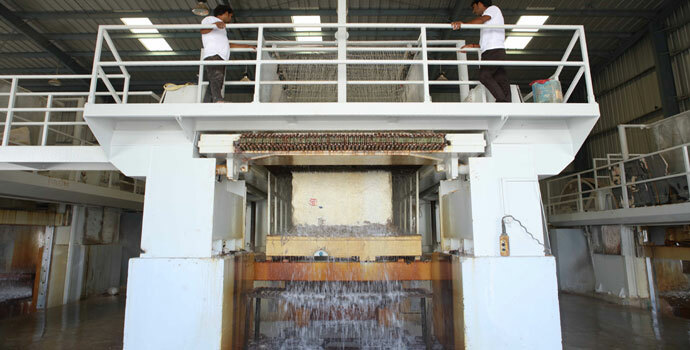 The reinforced blocks are brought to the Gangsaw machine to make it in slabs. The marble blocks are further fixed on a trolley with a wooden wedge, a mixture of Plaster of Paris (POP), Wood Wool is added to protect the surface and then is processed for cutting it into slabs. To ensure that the fragile slabs reach safely to their final destination, Fiberglass Net is once again applied on the back face of the marble before transportation. The Fiberglass Net is removed, before fixing on the floor. After grinding the blocks, the beauty of marble is enhanced through a Resin and Hardener treatment. It is mixed in a particular ratio to give optimum gloss and strength to each slab. The process ensures that there are no cracks on the slab, excess resin on the surface is removed to strengthen and enrich the surface. The treatment is achieved through the state-of-the-art 'Prometec – 150', an ultra-modern plant. 2. Drying in the heating chamber. 7. Offloading of slabs by robot. The process gives the final finish to the slabs. 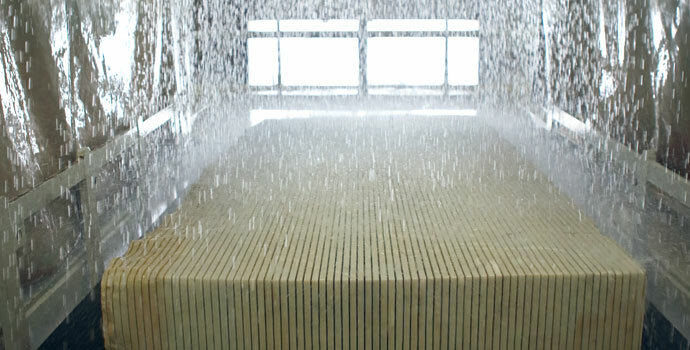 It's achieved through cutting-edge equipment that removes even the smallest grains to even the surface and polishes it to ensure a crystal-glow on the slabs. Now, the Marble Slabs are ready to shape your imagination and are then taken to gallery.